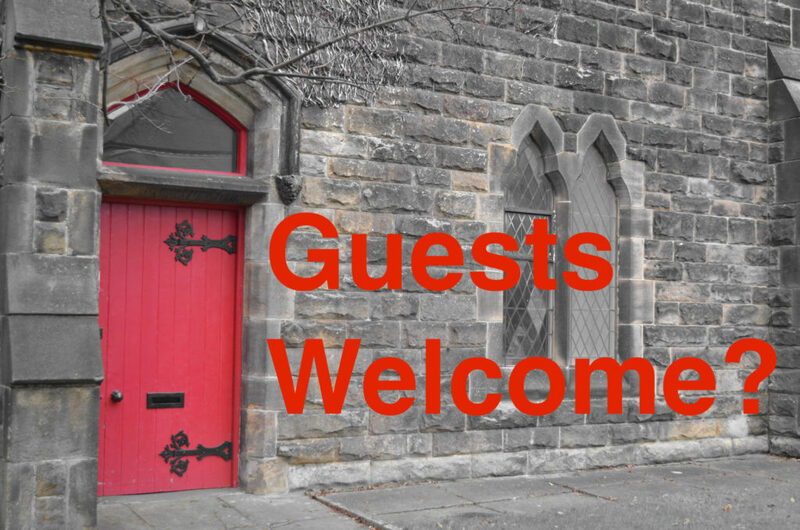 As I mentioned in my recent Holy Week post, we are coming up on two Sundays when you will get lots of guests at your church. Are you ready? If you already read my three-part series (Part I, Part II, Part III) on church websites, maybe you made some progress getting ready for guests on that front, yay you. And of course you’ll want to have your greeters ready for guests and fix your service leaflets, and other pretty obvious steps. But don’t forget the building itself. Now, in the couple of weeks before Holy Week, there’s only so much you can do for the building. I’ve divided this list into “right away” and “long term” items. It’s not comprehensive, but I hope it’s useful. This list is at least partly based on my own experience as a regular guest in churches, in buildings unfamiliar to me. Consider the drive by. You’re not going to get a big landscaping project done in the next two weeks, but you could make sure to take care of some obvious easy fixes for potential guests. I’d suggest getting a friend or a co-worker — someone who doesn’t go to your church — to give you some feedback. Have them tell you what could be better or more attractive. Again, I’m not talking paint or landscaping. But maybe there’s clutter to be moved or some easy fixes. How’s your church sign? Make sure you’ve got an inviting message on your sign, if you have a sign that does messages. I once saw an Episcopal church with a sign that read “He was despised, rejected, a man of sorrow acquainted with grief” on Maundy Thursday. Now, that’s a good scriptural message, but it’s probably not what you want if you’re trying to encourage guests at Easter. As you know, dear reader, I’m all about Holy Week, but your church sign isn’t for disciples, it’s an evangelism tool. Aim that sign at people who have never been through your doors, but who might consider it with a warm, inviting message. If you have space, service times are a bonus. Your website is a must. Check the lawn. Mow the grass or rake it or whatever it needs. Put on your best face. Guestbook. If you have a guestbook in your entry, make sure it’s ready for new people to write their info. Time for a new pen, if needed. Declutter the entrance. Walk into your entry way or narthex. Try to pretend you’ve never seen it before. See those old, unclaimed coats? Piles of unkempt papers? Old newsletters? Flyers for events that happened back in Advent? Three never-used wheelchairs in the corner? It all needs to go (except keep a wheelchair if you think someone might actually use it, but ponder how that person would have gotten to church in the first place). You’ll pardon the Forward Movement guy for suggesting you attend to your literature rack if you have one (straighten it up, toss old stuff). Most important, just get rid of junk. Be ruthless. Declutter the church. Look around the pews, the chancel, everywhere. Recycle old papers and move unused furniture. Straighten those prayer books and hymnals. If you have a children’s area, fantastic. Just tidy it a bit. Check the bathrooms. On the big day, make sure the bathroom is spotless. Go crazy and put some flowers in. And of course, you’ll want to check paper towels and toilet paper and all your other supplies. Soap too! Make your bathroom look great, not just a museum of ancient plumbing like too many church bathrooms. Oh, and if there’s not a good sign outside the door, make a temporary one. Have materials for guests ready. If you have a brochure about your church or a folder for new members, have some ready to go. Many guests won’t want paper, but some will. When someone says, “I want to learn more about your church,” you want to be ready to meet that need. For some folks, it’s, “Here’s my email” or “Check our website.” But for others, they’ll like a paper packet. Lightbulbs. Now’s a great time to replace those lightbulbs, even the ones way high up. When someone walks in and a third of your lights are burned out, it says, “We just don’t care that much.” Go over to the church at night, and check the outside lights. You don’t want someone to trip on a poorly lit sidewalk as they leave an evening Holy Week service. Dust. The altar guild has probably scrubbed and polished all the shiny stuff near the altar, so why not get everything else in tip-top shape? Dusting woodwork and pews and so on might not make your church look fantastic, but I’ll tell you what. When people start noticing dust and cobwebs, that counts against you. Tidy the nursery. Toss old, junky toys. Tidy. Dust. Straighten. Drag a parent whose kid has never been there before over to the nursery, and ask if they’d want their kid hanging out there. If they turn up their nose, you still have work to do. Unlock the @#$& doors. No, really. I cannot tell you how many times I’ve gone to a church to attend services only to find locked doors. If you have to keep an exterior door locked for security, then make sure the door has a clear sign pointing to a working entrance. I promise you, it is not obvious to a first-time guest which door to use. Every single outside door either needs to be unlocked, or it needs a sign pointing to an unlocked door. Interior signage. Here’s what we did at a church I served back in the day. Before we got new signs, we used big post-it notes to make temporary signs with arrows all over the church, in all the places we thought we might need signs. Restrooms this way, church that way, and so on. Then we got people who’d never been inside the church before and tested them. For example, we put someone in the nave, and said, “Find the bathroom” or “Coffee Hour is in the Parish Hall, go there.” We had someone enter through one of the doors and said, “Find the church for worship.” Then we watched to see how they did. It was fun for them, and we were able to tweak what we needed. Do not rely on current members to figure out what signs you need. Only a first-time guest can validate if you have the right signs. If you already have signs, then get some guests to come and test what you have, so it can be improved. Full Accessibility. There’s way more here to be said than I can fit in a blog post. It’s important. If we want the church to be for everyone, the building needs to be for everyone. Even though churches aren’t required to comply with the Americans with Disabilities Act, it’s worth voluntary compliance. Maybe that’s not possible with some older buildings, but that raises other questions. I think it’s also important to be honest. Don’t say “Fully accessible” when the building isn’t. So, for example, if a person in a wheelchair can’t celebrate the Eucharist, then your building isn’t fully accessible. It’s not just ramps, but resources for people who are visually impaired and who have other needs. There are folks who do this for a living, so get some professional guidance. Don’t do what one church I know about did: they wanted a wheelchair ramp into the building, but they didn’t consult experts and didn’t follow ADA guidelines. So the ramp was only partially useful. It couldn’t accommodate some wheelchairs, and it was too narrow for wheelchair users to get themselves up the ramp, requiring someone to push and make the turns. A couple thousand more bucks and that ramp would have been awesome rather than infuriating. Landscaping. Get professional help or some help from someone who does this for a living. Maybe there’s a member of the church or a friend who can give some guidance. This is not my thing, but I know in two churches I served, we did some volunteer-driven landscaping changes under professional guidance, and it made an enormous difference. Trimming this, moving that, planting here, clearing there. It can be really easy to improve greatly the look of a church building. Exterior signage. Ask people, maybe at the grocery store, if they know where your church is. If they say no, ask if they drive down the street it’s on. If they drive on that street but don’t know about your church, then your sign stinks. Also, is it really obvious to a first-time guest where to park and how to enter the building? The only way to find out is to get some mystery shoppers. Worship times. Make sure your worship times are clearly visible from the outside, and accurate. If you change your Sunday service times through the year (which is a really bad idea), you need to keep this sign updated. I know of one church in a city center which has literally nothing about the fact that they offer Sunday worship on the outside of their building. So don’t be like that. Best for the guest. I’ve seen quite a few churches who have the best parking spaces reserved for staff. Um, no. The best spots should be for people with mobility issues and for guests. Staff (especially on Sundays and for events) can park far away, unless of course you have staff with mobility needs. Same for pews, by the way. Back when I was in Rhode Island, I learned that Trinity Church in Newport used to give its best seat (where George Washington sat, or so the story goes) to guests every week. How cool is that? You get the idea. Please add your own suggestions. I know, this is extra work, but it’s very much worth it. And Jesus cares a lot about how you welcome guests and strangers (see Matthew 25:35b). Image: George Hodan, public domain, from here. Make the service guest friendly too. A single booklet with everything, if you haven’t got screens, or a download for their devices. Get a few people together and talk through what you do and reimagine the whole service as if you were arriving for the first time. If you are the service leader, it’s nice to talk to the congregation as family but remember this can isolate the stranger. It’s appearing as a church desperate for members how about staying out of politics and stop twisting the word of God to accommodate everyone. I’m not sure what you mean by all those things, and I don’t want to assume. If my intention interests you, I can say that I’m not desperate in any way when it comes to the church. My point in writing posts like this is to clear away easy obstacles to the Holy Spirit’s work of converting people and then to let God get to it. It’s tempting to respond to your pointed comment about politics in kind, but I’ll just say this: Jesus was political in the extreme. Paul was political. In fact, most everybody who has a big speaking part in the Bible gets political. If you’re interested in conversation, please do stop by and comment again. Previous story NEWS FLASH! BREAKING EXCLUSIVE! Blue Book details revealed!